Clothing size M - what are the parameters? Choosing clothes in the store, not so easy to understand the symbols on the labels. What can we say about long-distance purchases! For imported products, as a rule, should correspond to the sizeand adopted in the producing country, so good luck with the shopping it is better to explore name your size in different reference systems. How to choose the right size clothing catalog "bonprix"
Names European size is easy to determine if you know what size at the domestic scale, it fits your figure. Subtract from this value 6, and you will receive your European clothing size. That is a miniature 40-mu corresponds to 34 to 42 receive 36 to 44 – 38 and so on. Men are luckier – size scale European producers comply with Russian numbering. However, keep in mind that every manufacturer has their own patterns, so the clothes are the same products from different stores can sit on you in different ways. The best option is to try it and remember what the marking on the label meets your dimensions. However, while shopping by catalog or online, consumers are deprived of such opportunities. Therefore it is better to arm with a measuring tape and accurately know your size. To determine the size of quite three main parameters: bust, waist and hips. Measure the bust at the acting its points. Place the ribbon on the waist, find the narrowest place and measure, tightly clutching "centimeter", but not tightening. Hip measure at the most protruding points of buttocks. The growth measure, standing at a straight vertical surface leaning against the back of his head, shoulder blades, buttocks and heels from head to soles. 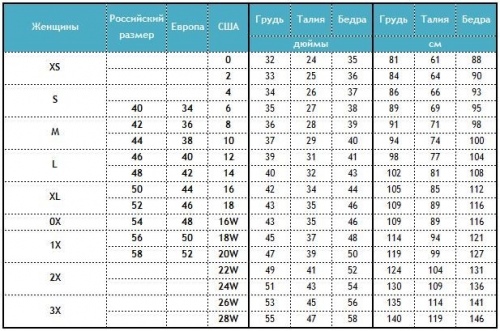 Use the chart and find your size according to the Russian and European scale. Universal dimensional scale, called letters, is easy to remember, if you are at least somewhat familiar with the English language. XS – extra small (very small), S – small (small) M – medium (medium), L – large (large) XL – extra large (very large). Try to shop at online stores, where the manufacturer himself provides the dimensional table, with which you will be able to check.